DR. JOHN ROBERT ROSS, M.D. The Domain name, "Great Clan Ross", is intended to honour Dr. John Robert Ross, M.D., one of the founders of Clan Ross Association of Canada, Inc. in 1960. In May 1965, at the annual meeting of the Association in Montreal, Dr. John was appointed President by Chief Designate of the Clan, Sir Charles Campbell Ross, Q.C. At this time, Dr. John was preparing his book "The Great Clan Ross", which has become the definitive reference for the history of the Clan. During his research he came to know Chief Rosa Ross of Pitcalnie and Sheriff Charles Campbell Ross of the Shandwick Branch, the Chief Designate, who collaborated on the book together with his son, the current Chief of Clan, David C. Ross of Ross. The book was published in 1968 and is now in its third edition. Through his correspondence that arose from the first edition of this book, he assisted, in the 1970's, in laying the foundations of the Clan Ross societies in the USA and New Zealand. In 1983, Mr. W. Hugh Ross of Wanganui, NZ, was asked by Dr. John Robert Ross, then President of CRA-Canada, to volunteer as the representative of Clan Ross in New Zealand. Shortly afterwards, Chief David Ross of Ross and Shandwick formally requested Hugh to become the Commissioner. In 1933, Dr. John Ross made the significant discovery, while working at the Sick Children's Hospital in Toronto, that infants were becoming poisoned by the lead paint used on toys and cribs. Subsequently, he developed a test to detect lead poisoning ... and he was instrumental in persuading the Ontario government to ban lead paint on children's furniture and toys. On October 22 of 1994, Clan Ross was saddened by the passing of co-founder Dr. John Robert Ross, who was also an innovator in the areas of pediatrics and battlefield medicine. 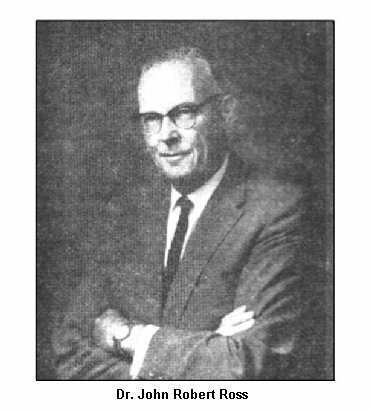 Doctor John Robert Ross (1901 - 1994) was a Canadian of whom all Scots can be justifiably proud. The registration of the domain name "GreatClanRoss" was completed on May 15, 2000, at no cost to the Clan Ross Association of Canada, Incorporated, and the domain name, data set-up and brochure are held "in trust" for the Clan Ross Association of Canada, Inc. The year 2000 marks the 40th Anniversary of the founding of this society. The Clan Ross Association of Canada needed an internet site, whereby its goals and interests may best be served in a dedicated, responsive, current and informative manner. At the Annual General Meeting on July 16, 2000, the executive and members present approved two motions unanimously ... first, that the internet domain of "GreatClanRoss.org" will serve as the web site for the Clan Ross Association of Canada, and second that J. Douglas Ross will be the webmaster in charge of the site.